This edition published by John Wisden & Co.
A plea to any adult reader of Young Wisden: don't be put off by the title. This splendidly enjoyable and highly informative book may be aimed at the newer and younger generation of supporters but I am sure that I would not be the only reader not, sadly, within this category who has or will enjoy this book. This is the second edition of this concept which was first published in 2007. There is everything imaginable in the book which any fan will not only enjoy but find of great interest and, however much we like to think we know about the game, I will bet that there is something else in this book that will add to our knowledge. 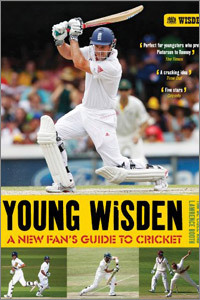 It is good to see an index and the cerebral Tim de Lisle's introduction perfectly outlines the aim of the book and how Wisden likes young people to enjoy the game. Naturally written for the younger generation, the book is written in an easy manner and covers the history of the game, tips on how to play the game, countries - including non-Test playing - where cricket is played, current resumes of international sides with team profiles, grounds etc. In short, just about everything and lavished with both black and white and colour photos. There is a lot of information crammed into the book's 132 pages but it is still easy to read - and difficult to put down. It is nice to see a women's section and the statistics throughout the book are formidable. An interesting section is the books section which gives an age guide where the suggested books might be enjoyed. There is far too much of interest to remotely start mentioning in this review and my advice to anyone, young or not so young, is to go out as soon as possible and buy it. Not only useful for the history of the game to present day trends, records etc it is a thoroughly enjoyable and useful guide to everything about the game.